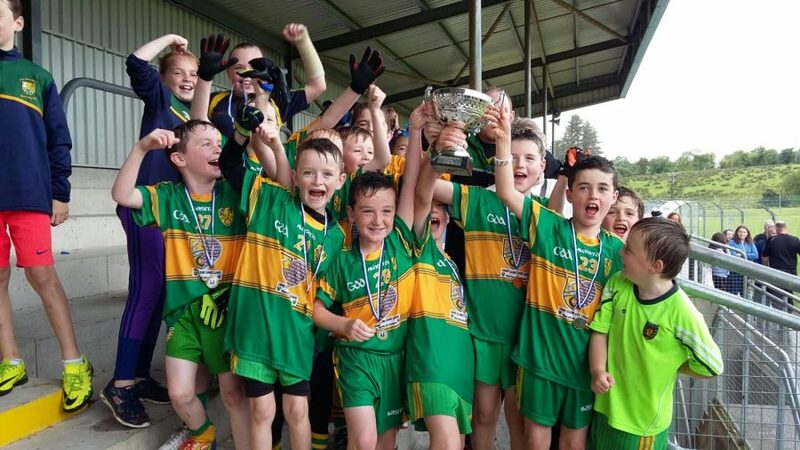 On Saturday the 10th of September, an energetic young Ardara U9 side, competed in the first Liam Brown U-9 tournament in Donegal Town. Run by the Four Masters club, the side managed by John McConnell & David Hennigan, defeated Enniskillen Gaels, Aodh Rua and Glenfin in the Group Stage of the event. In the Quarter Finals, they defeated Glenties, followed by a Semi Final win versus Kilcar. They followed this with a victory in the Final against Buncrana by a four point winning margin. To put the icing on the cake, Shane Sweeney (son of Sean & Lorraine) received the award for Player of the Tournament. Pictured are the Ardara team who won the first Liam Brown U-9 tournament run by Four Masters on Saturday last. Defeating Buncrana in the Final. Also pictured are Marc and Mary Brown presenting the Player of the Tournament award to Shane Sweeney of Ardara.